Staghorn fern, (Platycerium bifercatum), does not look like a typical lacy fern, but resembles a large pair of elk antlers. The staghorn fern is an "epiphytic" plant, which means that it survives by attaching itself to the bark of a tree. 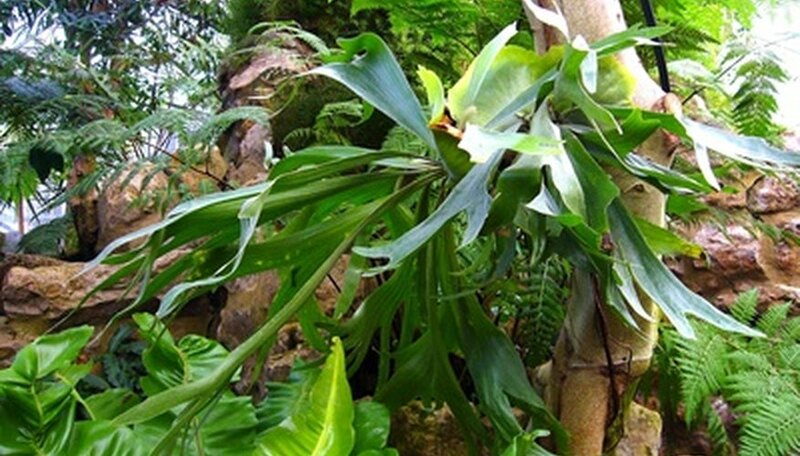 Although the staghorn fern depends on the host tree for survival, it doesn't harm the tree. Staghorn fern is a fascinating plant to grow at home, and over time it can become very large. To divide a large staghorn fern, cut the plant apart when the frond shield has turned brown and dry. Water the staghorn fern thoroughly the day before you plant to divide the plant. A few hours before you divide the staghorn fern, place a large handful of sphagnum moss in a bowl of water, and allow the moss to soak until it's saturated. Look carefully at the staghorn fern, and you'll be able to see obvious divisions in the fern between the original plant and the smaller "pups." Use a serrated knife to cut the staghorn fern between the main part of the fern and the pup, cutting deeply enough to sever the roots. If the plant is extremely large, you may need to use a saw. You can cut the staghorn fern into two larger sections or several small sections, but larger sections will rebound faster. Squeeze the excess water from the sphagnum moss. Pack a clump of damp moss around the newly divided pup, and the area on the parent plant where the pup was removed. Mount the newly-divided pup on a sturdy board. Attach with plastic-coated wire or wrap to the board with fishing line. Be sure the new fern is facing the same way that it was facing previously. Hang the staghorn fern in a shady place where it will be sheltered from heavy winds. Houston Chronicle: How to Divide My Gigantic Staghorn Fern?